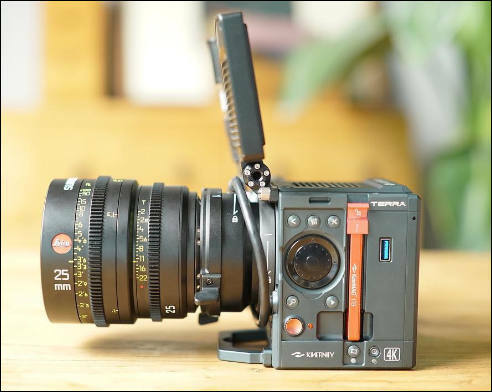 TERRA 4K as new TERRA member featuring with High Speed & Low noise 4K CMOS, sub-S35 image format. Photo with Summicron Lense, KineMON, SideGrip as handheld cinema camera. I'm interested in this, 4k for 4k raw is cool And I like that Kine uses mirrorless mounts on their cameras for focal reducers. It should have higher max iso compared to blackmagic too. This is a rough cut of a quick exposure, color, rolling shutter, and resolution test for Arri Alexa mini, Red Epic Helium, Terra 6k, and Terra 4k. Guess who's talking Kinefinity at the BSC Expo…? I suggest that when there are two versions of a video, you link to the Vimeo version. In this case, PB himself says the Vimeo version is much less compressed and filled with artifacts. You can also download the original, and avoid annoying ads. Camera will be able to record 160fps 4K. Also added is 320fps 2K mode..